Chicken cordon bleu kids cooking party. Try this award winning and easy recipe for this Chicken Cordon Bleu kids cooking party. Chicken Cordon Bleu is a French dish which is translated to mean blue ribbon. You will want to write down the Chicken Cordon Bleu recipe below. Create one for each child that will be at the party. Once you know the number of children coming go through the list of things needed especially utensils, bowls, etc. If you need extra ask friends or family if you can borrow some items for this Chicken Cordon Bleu kids cooking party. Small rectangle disposable aluminum pans. This will allow each child to prepare their own pan. Bowl- 1 or 2 large depending if you are doubling the recipe-for mixing sauce. Several rolling pin(s) or kitchen mallets for flattening chicken breasts-not necessary to have one for each child as they can share. Plastic gloves if you'd like to use these when handling meat. If not make sure everyone washes their hands after handling raw chicken. Tear off sheets of waxed paper to use while preparing chicken. This recipe is for 6 children increase the recipe as needed for your kids cooking party. Give each child a pair of gloves if using them. This will help with kitchen sanitation when handling chicken but if you prefer they can use their hands and wash well after handling chicken. To start this Chicken Cordon Bleu kids cooking party each child should have a small rectangle aluminum pan, 2 sheets of waxed paper, a chicken breast, a slice of cheese and a slice of ham. Have each child place a chicken breast between two sheets of waxed paper. With a meat mallet or rolling pin have them beat chicken several times to flatten. Place chicken in aluminum pan. 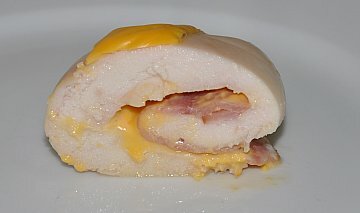 Place a slice of ham and a slice of cheese on top of the chicken. Roll up and hold together with toothpicks if needed. Remove gloves and wash hands. In a bowl, have one child add a can of cream of chicken soup. Have another child add sour cream. Take turns stirring. Add 1/2 Cup of milk if you'd like a thinner sauce. Each kid chef can spoon sauce over their chicken. Have each child put their name on their pan with masking tape. Cook at 350 degrees for 30-40 minutes until chicken is cooked through. While the chicken is cooking, prepare a dessert or other recipe you have planned, decorate aprons, chef hats or play cooking games. Back to Kids Cooking Party from Chicken Cordon Bleu kids cooking party.